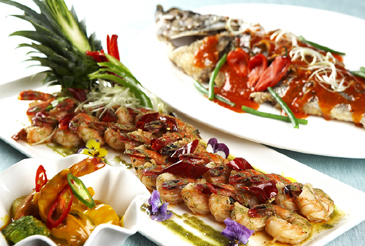 Set your taste buds on fire with the world's spiciest cuisines at The Westin Chosun Seoul's Cafe Royale! Indulge in some of the world's most delicious and hottest dishes, guaranteed to make your mouth water and eyes tear. Staying true to the old culinary philosophy of fighting heat with heat, our fiery foods will cool down your body during the sweltering summer days. With fresh seafood, vegetables and meat enhanced with chili peppers, red pepper paste, and a fantastic variety of spices and sauces, each flavorful bite will leave you craving for another. Start with our delectable cold dishes like Spicy Octopus Salad, or Chili Crab on Coriander Wontons with Soy Mustard Sauce. Then savor the fierce flavors and tantalizing aromas of Hungarian Goulash, Thai Sour & Spicy Soup with Prawn, Pepper Roasted Australian Beef Cube Roll, Spicy Pork Sausage, and a whole lot more. This summer, excite your palate and stimulate your appetite with our sensational hot cuisines at Cafe Royale!